The share of manufacturing in GDP has been trending at 16-17% for some years now. The Government has set a target of taking this share to 25% of GDP by the turn of 2025. India has the potential to become a $5 trillion economy in seven years, with the manufacturing sector contributing $1 trillion, and services, $3 trillion. 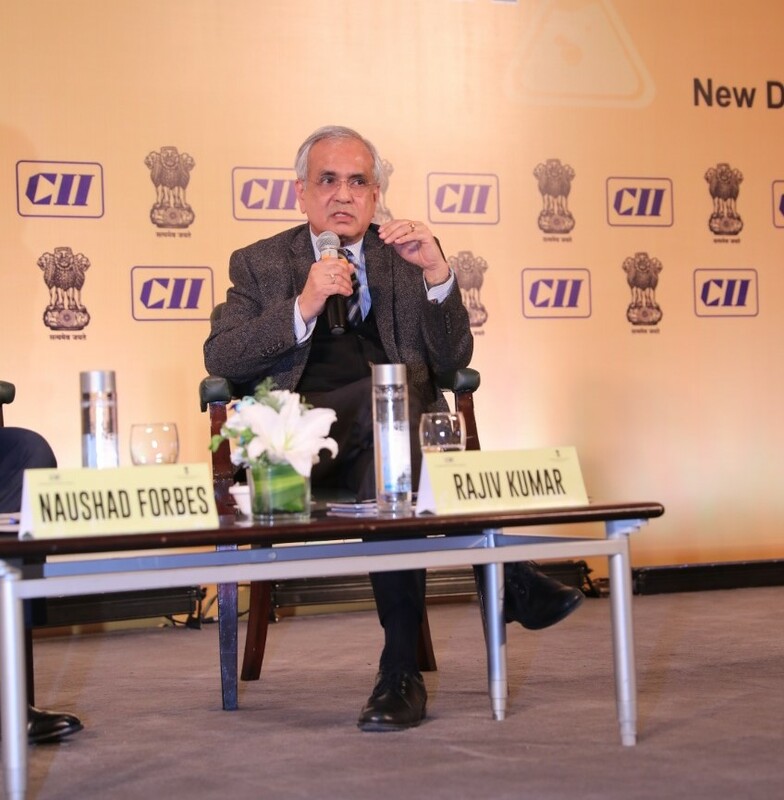 To target maximizing manufacturing value add, build momentum, and further strengthen an integrated approach, CII and the Department of Industrial Policy & Promotion (DIPP) organized the National Policy Forum ‘Towards a $1 Trillion Manufacturing Economy’ on 17-18 December in New Delhi. 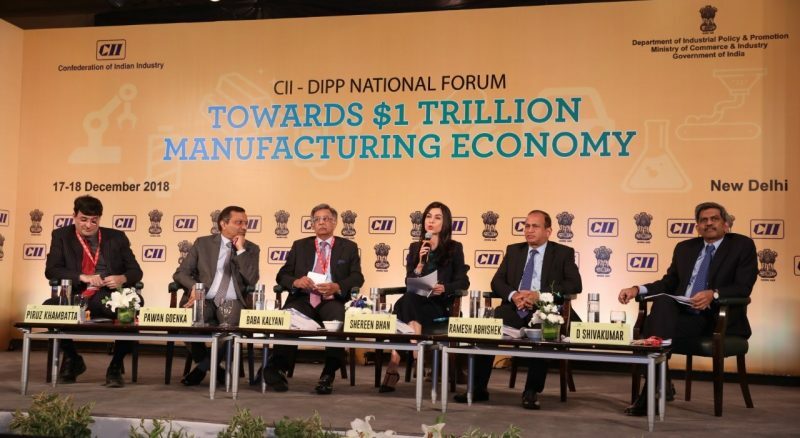 CII, in close association with the DIPP, has also initiated the exercise towards developing a roadmap for achieving a $1 trillion manufacturing economy by involving key manufacturing sectors. In order to incentivize and encourage Indian companies to compete globally by improving their exports, the Commerce Ministry is working on creating new policies, improving the Ease of Doing Business, scrapping irrelevant regulations, and formulating the concept of growth of GDP in every district of the country, stated Mr Suresh Prabhu, Minister of Commerce and Industry, and Civil Aviation, who was the Program Chair for the two-day forum. Dr Rajiv Kumar, Vice Chairman, NITI Aayog; Mr Ramesh Abhishek, Secretary, DIPP; Mr Amitabh Kant, CEO, NITI Aayog, and Secretaries from several relevant ministries were on board to make this initiative fruitful and impactful, both as a National Forum and to crystalize a national as well as sectoral roadmap. The entire initiative is being driven by a high-level Steering Committee under the aegis of the CII Manufacturing Council, chaired by Dr Pawan Goenka, MD, Mahindra and Mahindra Ltd, and co-chaired by Mr Deep Kapuria, Chairman, The Hi-Tech Group. The forum was designed to create roadmaps for the identified focus sectors while addressing the common disabilities affecting manufacturing competitiveness in India. The sectors shortlisted for the roadmap and the forum, based on their contribution, size, and potential, were Automotive, Textiles, Chemicals, Electronics, Capital Goods, Food Processing, Pharmaceuticals, and Metals and Mining. In addition, there was significant focus on various horizontal pillars of manufacturing, such as cost of doing business, ease of doing business and trade policy, technology and R&D, job creation and skilling, and more. The event created a unique interface with more than 15 sessions / policy roundtables engaging regulators, senior officials, secretaries and joint secretaries from different ministries and around 100 CXO s from diverse field of manufacturing. Introduce country of origin laws for the import of garments from Bangladesh, and work on establishing a Free Trade Agreement (FTA) with the European Union. Drive initiatives to completion, set up an inter-ministerial committee driven by a neutral agency such as NITI Aayog to hold true to targets, and actively promote targets of Capital Goods. Tweak trade tariff policy to promote local metal manufacturing; incentivize creation of SEZ / DS parks linked to Indian primary metal producers; re-evaluate existing (ASEAN, Japan, Korea) and forthcoming (RCEP) FTAs for the development of domestic metals. Investment in electronic components industry to be adjusted against the discharge of Defence Offset obligations. Electronics is a technology-driven industry: need to leverage our R&D, design, and innovation strengths, and encourage an innovation culture through incentives. State-level reforms: Accelerate the adoption of technology by implementation of land reforms, enable long term agriculture land leasing. Trade policy customization to meet the needs of the chemicals sector, including FTAs. Skilling: Establish skill universities through PPP in clusters where units are present. The event culminated with report-back presentations by the industry chairs of all 13 sessions (covering sectoral and horizontal issues) made to Mr Amitabh Kant and Mr Ramesh Abhishek, marking the beginning of the creation of the national and sectoral roadmaps to meet the aspirations of the Indian manufacturing sector. The inputs derived from the deliberations will soon find space in the actionable national roadmap for realizing the $1 trillion manufacturing goal of the country. The forum was highly successful and result-oriented. In the concluding session, the Secretary, DIPP, announced setting up of DIPP sectoral taskforces which would be inter-ministerial and co-chaired by him, the Secretary of the line ministry, and the industry CEO nominated by CII. The process of constituting the task forces has already been initiated by the DIPP, along with CII. The initiative is planned as an annual marquee event in the calendar of the Indian manufacturing industry to keep relevant stakeholders across industry and Government true to the long-term objectives for the Indian manufacturing sector. It will serve as a manufacturing health check on an annual basis while identifying the right policy and industry-level interventions to enable growth.